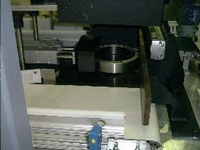 The Automotive Bearing machine consists of an entrance conveyor, an escapement pin, a pusher placement system, a V-Block locating system, an Electrox laser etching system connected to a height positioning system, and an exit conveyor. For control purposes, a NEMA12 electrical enclosure, a five button two line display, and a PC with custom software was also included. The machine is completely enclosed to minimize the risk of potential damage by the laser.